In 2011, we interviewed Jonathan Spyer about his book The Transforming Fire: the Rise of the Israel-Islamist Conflict. Our first question focused on his contrast between the real Israel and what he termed the “mythical Israel” – evoked by delegitimisers – which he characterised as a place of “uninterrupted darkness and horror, in which every human interaction is ugly, crude, racist, brutal.” It’s this mythical Israel – divorced from any trace of nuance, balance or context – which informs much of the Guardian’s coverage of Israel. Further, as is evident in their take both before and after the elections, the dominant view at the Guardian is that, unless Israelis follow their advice and radically change course on what is arguably an Israeli political consensus on security issues, the future will be bleak for Palestinians and Israelis alike. 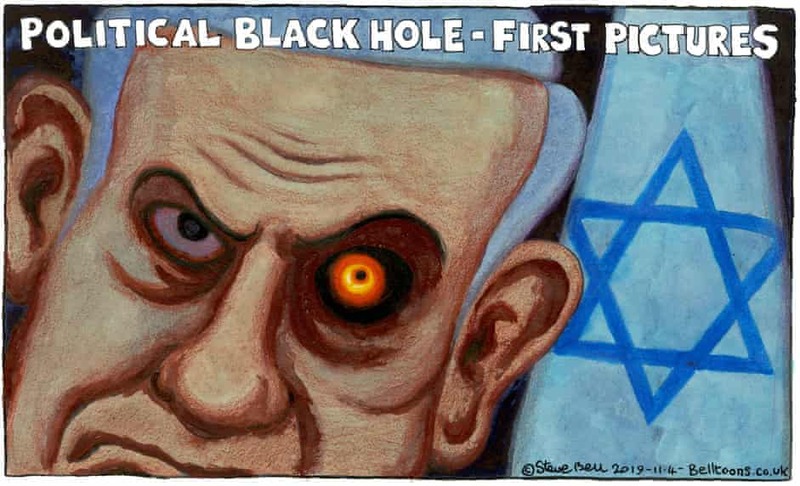 This dark scenario was best illustrated in a cartoon published today by Steve Bell, an image which draws upon recent news that astronomers captured the first photograph of a black hole. Though the putative topic is the re-election of Benjamin Netanyahu, the depiction of a black hole – the darkest entity in the cosmos, from which light can’t escape – in the prime minister’s eye, with the flag in the background, aptly illustrates the publication’s broader narrative suggesting the country is always on the verge of falling into the abyss – prophecies of doom which of course never materialise. Despite the fact that Israelis are – by any standard – increasingly prosperous, secure and content, and markedly less isolated internationally, Guardian editors never seem prone to examining their faulty predictions in an attempt to understand why they got things wrong. Rather, evoking the behavior of doomsday cultists who insist their fundamental beliefs are sound even after a prophecy failed, the Guardian continually doubles-down on their belief that Israelis are on a dangerous path and must be ‘saved from themselves’. Moreover, don’t be fooled into believing that their gripe is only with one Israeli leader, as opposed to the country as a whole. Their extreme anti-Israel coverage – which includes a consistent amplification of and support for BDS, the promotion of the apartheid smear and the legitimisation of those rejecting Israel’s right to exist – was no different during Labour and other non-Likud governments. Israeli prime ministers may come and go, but the Guardian’s mythical Israel endures. It’s not a misconception of reality in Israel. It’s a commercially-driven campaign to sell propaganda. It’s very simple, really. Scandals, sensationalism, and news that raises the ire of some individuals are what sell newspapers and The Guardian of Propaganda panders to gullible, fashion-conscious, amoral Brits who easily subscribe to that propaganda. As much as we want Der Guardian’s predictions to be right, they keep on getting Netanyahu wrong. He campaigns on the right and then pulls a Bibi and governs from the left. Whenever Bibi leaves Israel in an effort to influence the opinions of other nations, the other nations people take their frustrations out on the Jews who happen live among them. What an uncanny ability. Bibi and the BDS movement work hand in hand. Whatever Netanyahu does is used as an excuse to knock Israel. Which Israeli Prime Minister did “other nations” League of Arab Nations, EU, UN love??? Dumbkopf, It ain’t Bibi or any one else. It’s the success story called Israel that bugs anti-semites. Come on down to Crazy Eddies! Where self-declared Love for the Jewish State mirrors the same attitude as the Nazi Right! knuckleheadmoron, nazis AKA National SOCIALISTS are Leftists/Socialists. THAT is YOUR SHAME you brain damaged socialist. Your Love of Socialism blinds you. I pity you. Eddie, you’re so freaking crazy, that you pitying me is only a compliment. Any clear headed individual can read that I am doing something right.